Corrosion pits were observed in the deaerator storage section. 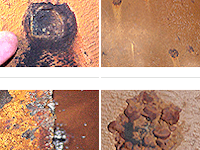 Corrosion pitting could be due to a number of items such as improper operation of the deaerator, a poor performing deaerator or mechanical failures within the deaerator. Corrosion pitting could be very serious due to the individual pit being the weakest link in the chain, regardless of shell thickness. A full inspection and repairs in deaerator in accordance with NACE and ASME codes.